"It Might As Well Be SWING!" delirious swing, big fun – dance floor is open! 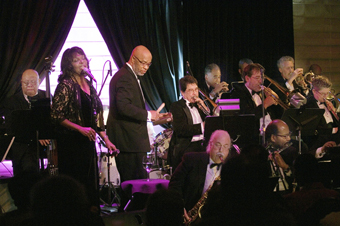 The Junius Courtney Big Band alights on the Freight's stage to bring in Spring with the swingin'est of big band dances. The full dance floor will be open as this 18-piece entourage lifts off to delirious realms of swing. Designed both for dancers ready to rip through their paces and for those who prefer to swing from a comfy seat, this Saturday night party cannot be missed. 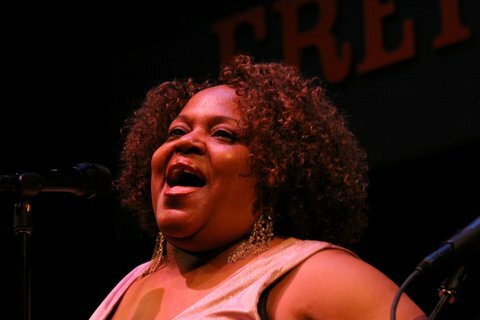 Ebullient vocalist Rhonda Benin steps in as featured vocalist, bringing her sass and soul to the proceedings. No stranger to the Freight (most recently as producer and performer of her packed-house “Just Like a Woman” all-star revue), Benin has impressive chops and a resumé to match, with appearances at SFJAZZ, Bay Area jazz festivals, Hangzhou, China and Rwanda on her list of credits. Benin is a long-term member of Linda Tillery’s Cultural Heritage Choir, and has also appeared with performers including Wilson Pickett, Odetta, Al Green and Patti Austen. A jazz powerhouse with a 50-year-plus track record and a reputation as "a Bay Area institution ...capable of cutting far better-known orchestras" (per Andy Gilbert), the Junius Courtney Big Band is made up of "jazz veterans who know how to tell a story in eight bars." The band is renowned for deeply-swinging arrangements and the terpsichordian tendency that jump-starts dancers. Over the 15 years of their Freight appearances, the band has been raising the roof: this is an organization with chops and a mission to have fun! From their previous dance nights at the Freight to their special concerts celebrating Billy Strayhorn and Earl "Fatha" Hines, the Junius Courtney Big Band with Rhonda Benin fills the hall with exuberance and soul. Grab your dancing shoes, your partner and head on down!